in Influencer Marketing, Social Media with tags Obama, Pay As You Earn, tumblr Both comments and trackbacks are closed. 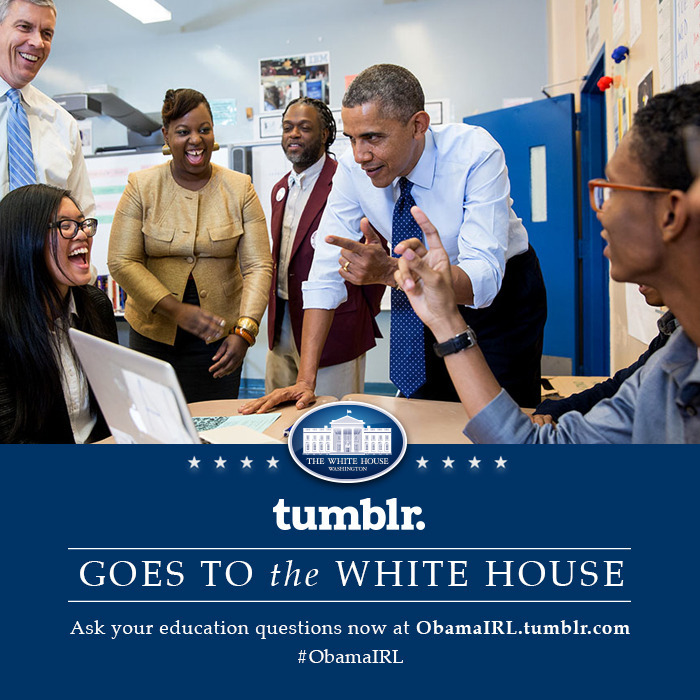 Yesterday, President Obama took to Tumblr to answer questions around a topic of great importance for the platform’s millennial audience – the “Pay As You Earn” loan repayment program. While Q&A participants may have been disappointed to learn that .gifs are not, in fact, acceptable currency under the new plan, the conversation was engaging nonetheless, and got the right audience talking about an initiative that otherwise could have been confusing, overlooked and even distrusted. Go where your consumers are. To put it simply, the self-centered era of “build it and they will come” is dead. In today’s ever-cluttered media environment where brands, politicians, publishers and Miley are all competing for attention, it’s the campaigns that connect with consumers where they already live and breathe that make a real impact. Don’t underestimate the value of doing things differently. This isn’t the first time Obama has done a Q&A – he’s trolled Reddit, hung out on Google + and live-pinned Michelle’s outfit changes. His use of Tumblr was half the news value, and got “Pay As You Earn” in more headlines than if he’d answered questions on any other platform, or via a standard press conference. Get creative when it comes to ‘celebrity’ talent. Sure, he’s the president and the Internet breaks when his treadmill photos leak. That being said, consider which personalities and assets your brand intrinsically has to offer – and find interesting ways to leverage them that will get people talking and add value to fans in the process. Put influencers at the core of the campaign. What wasn’t apparent to most outsiders was Obama’s use of influencers to drive the conversation. The administration worked with Tumblr to invite 20 of the platform’s most influential users to the White House to participate in the Q&A – smart move considering that 18 percent of those online influence the other 80 percent, per Forrester. Transparency is king. With the rise of citizen journalism and thus the never-ending news cycle, open two-way dialogue is more important than ever in establishing trust and foundation-setting for future crises. #YesWeCanCrisisPlan. It’s a rare, twisted day when you recommend business imitate politics (more red tape, please). But even after his 5+ years in office, marketers can still learn a thing or two from Obama’s historic social media savvy and grassroots approach. The big takeaway: Connect with your target audience where they engage, through people they trust with something they’ll actually care about.